The Doomed City is set in an experimental city whose sun gets switched on in the morning and switched off at night, bordered by an abyss on one side and an impossibly high wall on the other. Its inhabitants are people who were plucked from twentieth‑century history at various times and places and left to govern themselves, advised by Mentors whose purpose seems inscrutable. Andrei Voronin, a young astronomer plucked from Leningrad in the 1950s, is a die-hard believer in the Experiment, even though his first job in the city is as a garbage collector. And as increasinbly nightmarish scenarios begin to affect the city, he rises through the political hierarchy, with devastating effect. 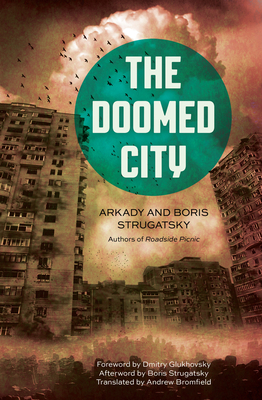 Boris Strugatsky wrote that the task of writing The Doomed City “was genuinely delightful and fascinating work.” Readers will doubtless say the same of the experience of reading it. Arkady and Boris Strugatsky were famous and popular Russian writers of science fiction, with more than twenty-five novels and novellas to their names, including The Doomed City, The Inhabited Island, and Roadside Picnic. Their books have been widely translated and made into a number of films. Andrew Bromfield has translated into English works by Victor Pelevin, Boris Akunin, Sergei Lukyanenko, Mikhail Bulgakov, Daniil Kharms, Leo Tolstoy, and the Strugatsky brothers. Dmitry Glukhovsky is the author of Metro 2033. He lives in Moscow.